This is a guest post by Sonja of The Borrowed Brushstroke. One of my favorite crafting projects involves re-purposing old jars of peanut butter or pickles. 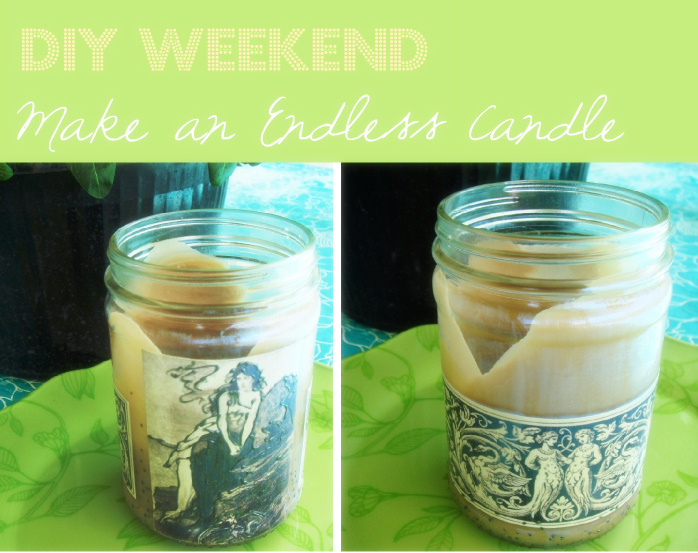 You can turn a simple glass jar into so many things- including an endless candle! I named it the endless candle because once the fragrance from the wax is gone, you can just add more fragrance and continue to melt the wax on a candle warmer OR you can melt the wax away and use the jar as a flower vase. If you are giving this as a gift, you may want to include a bottle of the fragrance with it so the wax can be refreshed easily. Mountain Rose Herbs has wonderful waxes and essential oils for candle making. For this glass jar, after washing all the labeling off, I printed out vintage images onto Lazertran glass transfer paper and then transferred them to the jar. Quick Tip - to maximize my transfer sheets, I fill them as full of images as I can even if I do not have an immediate use for some of the images before printing. I chose a mermaid theme from The Graphics Fairy (where I get pretty much all of my imagery unless I hand paint something). After the images set on the jar for a day, I painted the entire jar with a good coat of iridescent glass paint (Non-toxic Pebeo 160 Iridescent Blue). After that coat dried, I outlined the wistful woman and her surroundings with my pewter outlining paint to add definition (Pebeo Cloisonne outliner). For the actual candle, you can fill the jar almost to the top with wax flakes or beads and put the jar on a candle warmer. When the wax is entirely melted, add your fragrance (a little goes a long way), then let it cool back down. If you want a candle that you can light, not one that just melts on a warmer, Natures Garden has all kinds of lead-free safe wicks to add to the wax when it is still liquid. They also have Soy Wax that is very inexpensive - $17 for 10lbs! For a decorative touch, when my wax was completely melted, I tipped the jar toward me for a moment, away from me and side to side to make a flower pattern up the side of the jar. When the wax melts again, the pattern will melt, but it has a great effect when first seeing it. I spent $26.00 on my 12 Lazertran transfer sheets, $10 on glass paint, $10.00 on fragrance, $0 on wax as I am re-using wax from candles I no longer use that have lost their fragrance (wicking would be around $10.00 if I want to add wicks) and I could make at LEAST 10 of these endless candles, probably more. I plan to make quite a few of these for myself and also for Christmas presents. I want to buy soy wax once I re-use all of my old candles. Choose images and colors that your friends love, making each candle individualized. I am a notorious procrastinator, but I do my best to get started on Christmas in the Summer or it will be a mad rush December 20th to get everything finished... hahaha... almost everything I give is hand made! I hope this inspired you to find an old glass jar or bottle and make it beautiful. Happy Crafting! Sonja Petrik loves helping others discover their hidden creative talents. She firmly believes that everyone is creative,and that they just have to figure out which artistic medium suits them. Creating and working with her hands is a big part of her life and her heart. You can find many more creative DIYs on her blog. She also has two online shops - allaprimadesigns.com where she sells her handpainted glass creations and allaprimadesigns.etsy.com where you will find her sugarcrafted cake decorations. I love these. And the idea of giving them as holiday gifts to friends and neighbors is genius! I love finding old teacups and making decorative candles (not for burning) and old jars for pouring new candles in. Thanks for sharing this! I thought it was great that you order from Mountain Rose Herbs, so does my mom! It's one of the companies she loves. :) Nice DIY! Thank you so much everyone! :-D I love doing crafting tutorials. @Taylor- Yes, Mountain Rose is amazing!! @Tiffany- that teacup idea sounds absolutely lovely. Great idea and make perfect gifts!